If you thought we could get through two consecutive months without some big to-do about Star Wars, you were wrong! 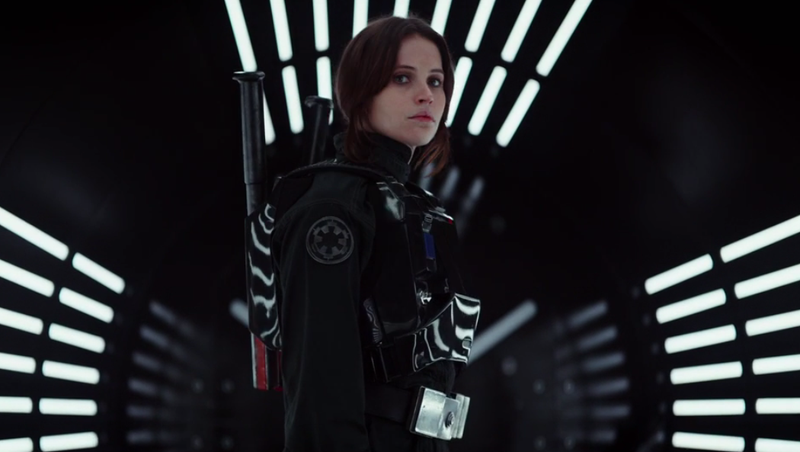 The teaser trailer for Rogue One reveals a whole new standalone story from the galaxy far, far away wherein a brand new heroine named Jyn Erso—or that’s what it sounds like, give me a break—is tasked with getting intel on “a major weapon,” i.e. the Death Star, for the Rebels. She is an apparent badass, first brought before Mon Mothma for the sort of teen badassery that includes “forgery of Imperial documents, possession of stolen property, aggravated assault, and resisting arrest.” When questioned about her crimes, she replies: “This is a rebellion, isn’t it? I rebel.” Very tight. Yes, this movie apparently takes place 35 years or so before the The Force Awakens, when the Death Star was still in the making. And it appears that our heroine, played by Felicity Jones, will have a ragtag team of spies to help her along the way. (Including Diego Luna, who looks at her once in this trailer, which means that sparks may fly and they may do it.) Forest Whitaker makes a cameo in the trailer as an apparent good guy, and Ben Mendelsohn looms as an apparent bad one. Yoda is not in this movie, I don’t think. We will find out who else is over the course of the next eight months, because this movie is not out until December 16th.... and it is only April.